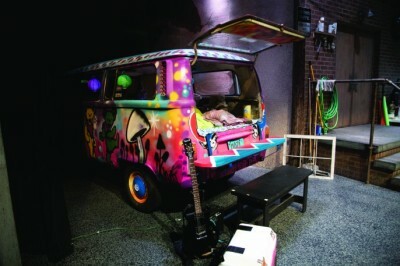 PHOTOS OF THE CAST AND SET FROM THE UPCOMING SHOW ‘TWO ON THE AISLE THREE IN A VAN.’ PHOTOS PROVIDED BY JOHN CAMERON. Florence Little Theatre presents Two on the Aisle Three in a Van November 9-18. Welcome to another stellar season at the Neighborhood Actors Summerfun Repertory Theatre, a friendly little playhouse where, due to a lack of wing space, the company spends their downtime in the parking lot around an aging hippie/now turned techie’s van. Those looking for refuge at the asphalt oasis include: a stressed-out artistic director grappling for funding, a wanna-be diva who’s realizing her ingenue expiration date has just about passed, a board member’s nephew vying to direct the musicals with a Tarantino spin and the “I’m no chorus boy” chorus boy who thinks every show should have a kick line - including Glass Menagerie. These are just some of the egos and obstacles that fall into the lap of Mike, a nice-guy director who ends up with far more than he bargained for. Anyone who’s ever seen a show may know these people. Anyone who’s ever done a show may be these people. Somehow, some way, the show must go on. And it does...just not always as planned. Two on the Aisle Three in a Van is underwritten by Habitat 2000 and is directed by Shannon Dunn. The cast features Ben Daniel, Meggie Baker, Frankie Sullivan, Lloyd Willcox, Larry Falck, Rhonda Cusaac, Cole Davis, Cody McKay, and mother-daughter duo Heather Ward and Hanna Ward. Two on the Aisle Three in a Van is recommended for ages 12+ (some adult language and situations). Length approximately 2 hours. The cast for the show is as follows: Mike played by Ben Daniel, Jeannie played by Meggie Baker, Vondo played by Frankie Sullivan, Jeff played by Lloyd Willcox, Harriett played by Heather Ward, Eric played by Larry Falck, Meredith played by Rhonda Cusaac, Daniel played by Cole Davis, Scott played by Cody McKay, Robin played by Hanna Ward.